Soham: A Story of Our Times is a short, beautifully written book about the grimmest of subjects – the murder of 10 year olds Jessica Chapman and Holly Wells in a Cambridgeshire village in 2002. Written by Nicci Gerrard, who sat through the entire trial of murderer Ian Huntley – the school caretaker – and that of his girlfriend Maxine Carr who was convicted of perverting the course of justice, this book is a wider look at the modern phenomenon of “conspicuous compassion”. Gerrard, a former feature writer for The Observer who covered the trials of Rosemary West and of Harold Shipman, details the collective mourning that gripped England during the two week search for the girls in the August of 2002. Gerrard cites Patrick West’s book Conspicuous Compassion (“…our culture of ostentatious caring is about feeling good, not doing good, and illustrates not how altruistic we have become, but how selfish…”, says West) and how society celebrates psychological pain and needs to “feel” by grieving in public (think Princess Diana). Soham has a significance for me in that I arrived back in England to start life with my soon-to-be husband a few days after Holly and Jessica had gone missing. The famous photo of the girls in their matching Manchester United tops, taken the afternoon they were murdered, was a constant presence on the television news. The weather was hot and each day you woke wondering if the girls would be found. Huntley is serving a life sentence for the murders and his ex-girlfriend Maxine Carr, who was one of the most reviled women in Britain – an almost modern-day Myra Hindley – served an 18-month sentence and has been granted a rare, lifetime injunction to protect her new identity. Carr was not involved in the murders but lied about her whereabouts on the evening of the murders to protect Huntley. 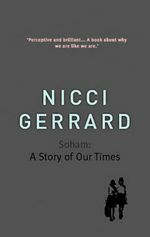 Soham: A Story of Our Times by Nicci Gerrard is published by Short Books. Gerrard also writes psychological thrillers with her husband Sean French under the name Nicci French. Sorry to post here but I cant see anywhere to contact you. I own and operate Crime Case Files and wanted to know if you would be interested in doing a link exchange? I can also add your blog link to my new information article section that we are about to launch next month. Even a guest blog exchange if you are interested. When she began writing to and visiting some of the most notorious murderers in the United States, British journalist and model Victoria Redstall embarked on an alarming and controversial investigation. She has now spent years visiting high security prisons and come face to face with the most terrifying men on death row – who have opened up to her with surprising and often brutal honesty. ·	Through in-depth face-to-face interviews, Victoria has got to know sadistic killers like Gary Ray Bowles and Keith Hunter Jesperson, ‘The Happy Face Killer’. ·	Revealing these extraordinary first-hand interviews for the first time, Serial Killers: Up Close and Very Personal brings a new and chilling perspective to the crimes and personalities that have shocked the world. ·	These convicted killers have opened up to Victoria in a way that they would never do to psychiatrists, prosecutors and other authority figures… and have revealed terrifying chapters of their lives that might otherwise have stayed hidden forever. In this chilling book Victoria frankly shares every detail and insight, bringing the reader up close and very personal with some of the most dangerous psychopaths on the planet. Victoria Redstall was born in Surrey and moved to the United States at the age of 19. She studied broadcasting, reporting and journalism at Santa Monica College. She has had huge success as a model and as a spokesmodel has represented companies such as Ralph Lauren and Harley Davidson. She made a documentary about serial killers in 2008 and has been interviewed on national American Television including the Montel Williams show. Her broadcasting career has also seen her work as a weather girl and a helicopter traffic reporter on high profile American television networks.